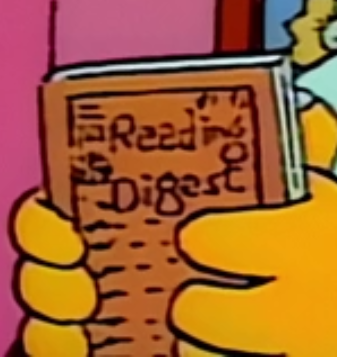 Reading Digest is a magazine that the Simpson family got through the post. Homer takes a shine to the magazine and starts to read it all the time. Homer started reading it to the family to get them interested too. Homer even reads it instead of snuggling. It was in the magazine that a competition to win a trip to Washington, D.C. was found, which Lisa entered. Reading Digest is an obvious parody of Reader's Digest. Modified on March 21, 2012, at 18:15.